The Samsung Galaxy S5 is the most successful device that was launched by the Samsung. This device features almost all the options of Samsung’s Galaxy Note series. It comes powered by 1.9GHz octa-core Exynos Octa 5420 processor and it comes with 2GB of RAM. If you have purchased the device and stuck with any of the options on your device and didn’t get the option through the user manual or guide. Then here are few tips and tricks that can help in exploring your device with ease. 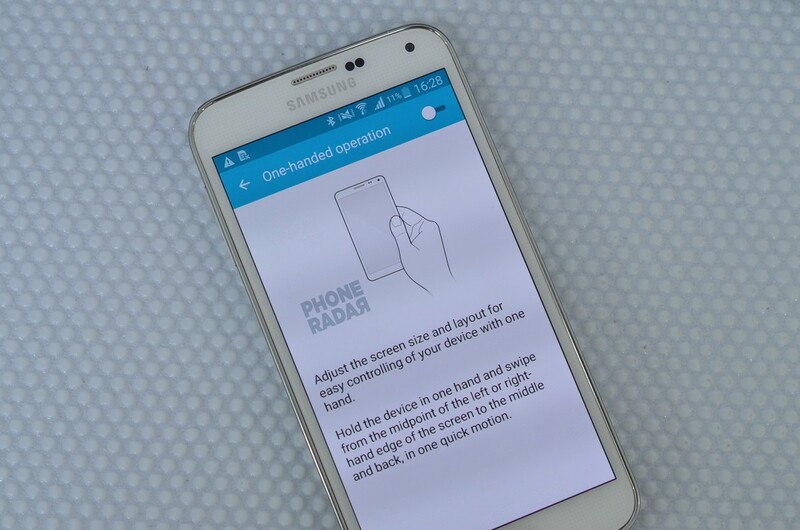 How to take a Screenshot on my Samsung Galaxy S5? How to use the Power saving modes on the Samsung Galaxy S5? 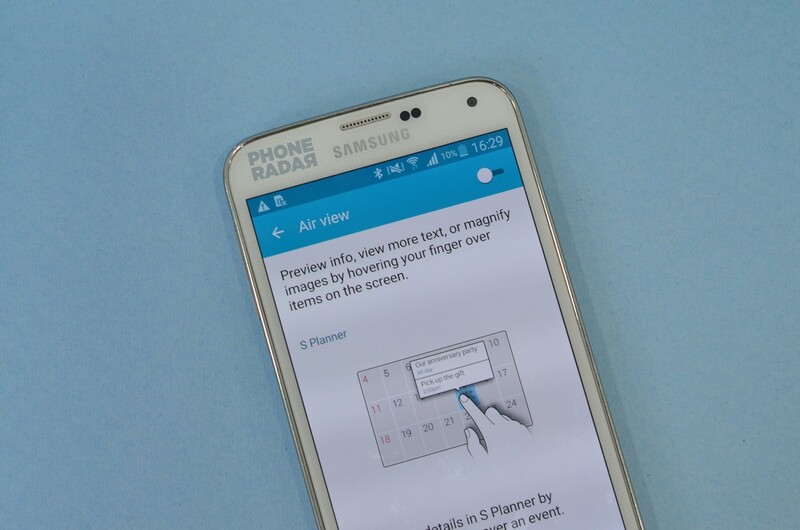 How to use the Screen pinning feature on the Samsung Galaxy S5? 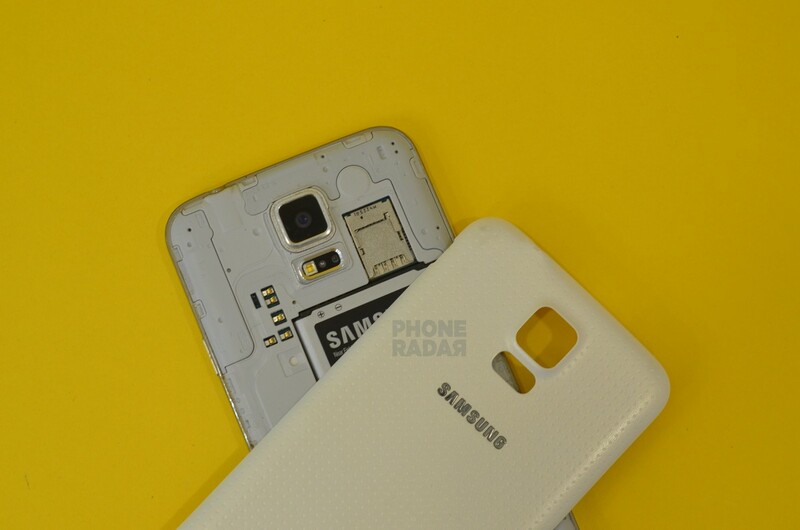 How much is the internal storage on the Samsung Galaxy S5? Will the Samsung Galaxy S5get Android Marshmallow 6.0 Update? What are the Motions and gestures available on the device? How enable the One-handed operation on your device? How to use the Multi Window option on your device? How to add fingerprint scanner on your device? How to use the Air View option on your device? How to setup the S Health option on your device? Insertion of the SIM card is the first thing that you do when you purchase a new device. To insert a SIM on your device, power off your device remove the back cover. Now remove the battery and insert the SIM card in the respective slot. You have successfully inserted SIM card on your device. Samsung Galaxy S5 is a single SIM smartphone and supports the 4G LTE connectivity. The SIM card supported by the device is Micro SIM card. To share a data network on your device, open the Settings and tap on Tethering and Mobile Hotspot. In the new window tap on Mobile hotspot and toggle the button on the top right to enable that on your device. To set the network name and password, you need to tap on the three-dotted button on the top right of the screen and click on Configure hotspot. You can now add the network name and password to your hotspot. Motions and gestures help in using few of the options on the device with ease. The motion gesture options available on the device are Air browse, Direct call, Smart Alert, Mute/Pause and Palm Swipe to Capture. The air browser options help in scrolling the page just by moving the hand over the sensor. Direct call option helps in lifting the call directly when you place the device at the ear. To use these options, open the Settings and tap on Motion and gestures. Now tap on the option and toggle the off button to enable them on your device. To capture a screenshot on your Samsung Galaxy S5, you need to press the power button along with home button. The screenshot is captured and saved to the gallery. Android Updates help in fixing the minute bugs on the device. 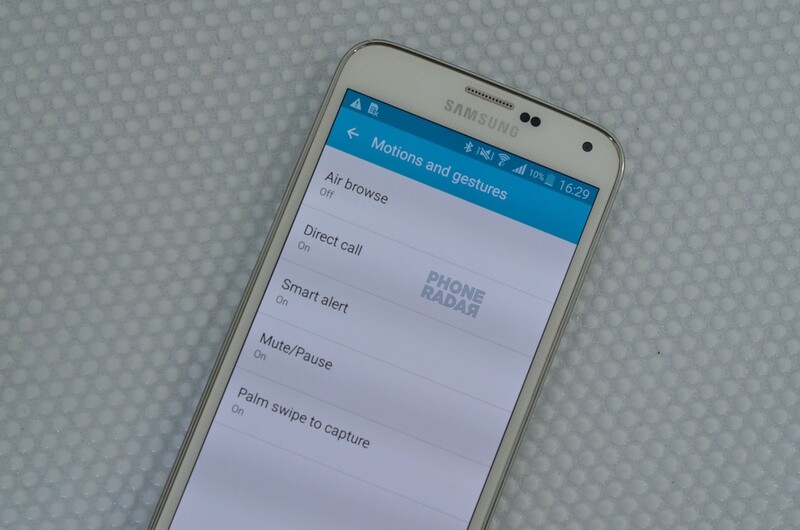 To check for updates on Samsung Galaxy S5, Open the settings and tap on About Device in System section. In the new window click on Software Updates and further tap on Update now. The device checks for updates and if no updates available then a message stating “The Latest Updates have already been installed” is displayed on the screen. External apps can be installed by enabling the unknown sources options on the device. To install an external app on your device, open the Settings and tap on security in the system section. In the new window, tap on Unknown sources and click on the OK button to enable that on your device. Now you can install any app with an external apk file on your device. The quick settings in the notification panel can be customized by tapping the edit button in the menu. Now you can customize the settings by tapping and holding the app and dragging among themselves. You can add upto 10 options in the notification panel. The rest of the options are hidden in the menu. 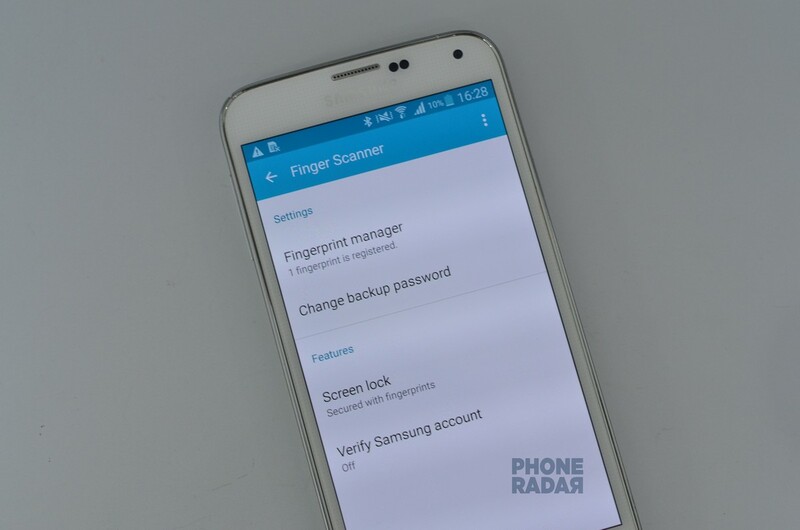 To add a fingerprint scanner on your device, open the Settings and tap on Finger Scanner. In the new window, tap on Fingerprint Manager and click on OK button. Now add the fingerprint on your device by swiping your finger from top to bottom on the home button. Swipe it until the fingerprint is added to your device. Now add the backup password for your device and confirm the password. Fingerprint has been successfully registered on your device is displayed on the screen, now click on done button. A new pop-up stating Enable fingerprint lock is displayed on the screen, click on OK button. You have successfully added the fingerprint and Fingerprint lock enabled is displayed on the screen. Power saving mode helps in enhancing the battery life of the device in case of emergency. The device comes with two types of power saving modes, i.e., Power Saving Mode and Ultra Power Saving mode. The Ultra power saving mode saves the battery by applying a simplified grey scale theme with limited options on the home screen. To use this feature on your device, open the Settings and tap on Power Saving in the system section. In the power saving window tap on the option that you want to use. Now toggle the off button to enable them on your device. Direction, G-Sensor, Acceleration, Light, E-Compass, Proximity, Gyro, Pressure, Linear Acceleration and Rotation Vector are the sensors available on the device and helps in automating your device. Yes, the device comes with LED notification lights on it. To use them on your device, open the Settings and tap on display in Sound and display section. In the new window click on the LED indicator option and select the options by tapping on the checkbox. The LED options available on the device are Charging, low battery, notifications and voice recording. Screen pinning option is available on the devices with Android lollipop on it. To pin the screen on your device, open the Settings and tap on security. In the new window, tap on screen pinning and toggle the off button to enable that on your device. Now, open the recent menu and tap on the pin button at the bottom right of the screen to pin the app on your device. To unpin your pinned screen, you need to press the back and recent button firmly for about 2-3 seconds together. The device comes with Gallery, Camera, S Planner, Voice Recorder, My Files, Samsung Apps, S Health, Smart Remote, few bloatwares and all the google related apps pre-installed on your device. Yes, there is an option on the device using which you can move apps from internal to SD card on your device. To Move an app on your device, open the Settings and tap on applications. In the new window, tap on Application Manager, the list of apps appears on the screen. Now tap on the apps that you want to move and click on Move to SD card in app info window. You have successfully moved app from internal to SD card on your device. The device comes with bloatware applications like Dropbox and ChatON pre-installed. Air View option helps you to preview the information just by hovering the finger on the screen. To use this feature on your device, open the Settings and tap on Air View in the Motion section. Now toggle the off button to enable that on your device. This option can be used in various options like a gallery, S Planner, Calender, etc. Yes, you can remove the bloatware from your device by uninstalling them from your device. To remove the bloatware from your device, press and hold the app firmly until the uninstall option appears on the top of the screen. Now drag the app to the uninstall button and click on OK in the pop-up. You have successfully removed the app from your device. The device comes with 16GB internal storage out of which 10.34GB of space is available for the users and rest of space is occupied by OS and pre-installed apps. The device comes with 2GB RAM out of which 660MB is used by the system, 252MB is used by Apps and 883MB of free RAM is available when no apps are running on the device. Yes, the device supports OTG drive and helps in sharing the files from OTG to the internal storage on your device. The head SAR value of the device is 0.56 W/Kg and the body SAR Value of the device is 0.41 W/Kg. After testing the device with various benchmarking tools here are their respective scores. Will the Samsung Galaxy S5 get Android Marshmallow 6.0 Update? The device comes with Android Lollipop on it out of the box. There is no information of the device getting the Marshmallow Update. You can also check the list of the device that may get the Android 6.0 Update by the end of the year. One handed operation helps you in using the device with one hand. To use this option on your device, open the Settings and tap on one-handed operation in sounds and display section. Now toggle the button on the top right of the screen to enable that on your device. Multi Window option helps in multitasking by dividing the screen into two parts and using two applications at a time. To use this on your device, Open the settings and tap on Multi Window, now toggle the off button to enable that on your device. To use this tap on the back button firmly, a menu pop-up from the right. Now select the options that you want to use for multitasking. S Health application is used to track the fitness by counting the footsteps on your device. To use this on your device, open the S Health application from the app drawer. Now click on the next button and tick the check box in terms and conditions section and tap on next. Further, you need to create the user profile by giving the basic details like name, gender, DOB, Height, weight and selecting any of the activity and click on Start Button. The options available on the S Health app are Pedometer, Exercise, Heart Rate, Food, Weight, Sleep, Stress, Coach, etc. To check you heart rate you need to tap on Heart Rate and place the finger on the sensor beside the camera. The Heart Rate is calculated and displayed on the screen. These are the general questions a user search for when he purchase a new device, if you have any other query about the device, pass them in the comment box, we will get back to you.